By Erin O'Neill on Wednesday, October 17th, 2012 at 7:30 a.m.
A campaign ad from GOP U.S. Senate hopeful Joe Kyrillos ties U.S. Sen. Robert Menendez to former N.J. Gov. Jon Corzine and Vice President Joe Biden. "In Context" is an occasional feature of PolitiFact National and its state affiliates. It is intended to give readers the context of a statement that has received widespread attention. Two campaign videos recently released by Republican U.S. Senate hopeful Joe Kyrillos show his Democratic rival as saying he "absolutely" supports policies that drove up the nation’s jobless rate. But the sound bite from incumbent U.S. Sen. Robert Menendez is only possible with a heavy dose of editing. The two videos from the Republican’s campaign piece together clips from an Oct. 10 debate between Menendez and Kyrillos on New Jersey 101.5 FM. Here, PolitiFact New Jersey won’t weigh in on the accuracy of how the videos characterize Menendez’s remarks. Rather, we will provide the full context of his statement, leaving readers to form their own conclusions. In the Oct. 10 debate -- the second of three debates between Kyrillos and Menendez -- Kyrillos tried to link Menendez to former New Jersey Gov. Jon Corzine, a Democrat. Near the end of the debate, Eric Scott, the moderator, allowed each candidate to ask each other two questions. In an edited video the Kyrillos campaign released the day after the debate, this exchange plays out. On his first question to Menendez, Kyrillos said, "Well, Eric, earlier as we introduced things I ... said that Bob is pursuing a Jon Corzine economic strategy. Jon Corzine appointed him to his seat in the United States Senate. He praised him in his work here in New Jersey ... He's pretty much followed … the same formula in Washington, D.C.: more spending, higher taxes, more debt and the results are 23 million Americans out of work. The unemployment rate is about 8 percent but the real, effective unemployment rate when you count people that have stopped looking for work or are in part-time jobs is more like 15 percent. So, I want to ask him, if he had to do it over again, would he do it the same way?" Then the video cuts to Menendez, who answers: "So the reality is, would I do all those things all over again? Absolutely." Go to 54:15 to hear the exchange. That campaign video chopped out nearly 50 seconds to give the impression Menendez’s "absolutely" answer directly followed Kyrillos’ question. But here is Menendez's full answer. Kyrillos asks Menendez, "if he had to do it over again, would he do it the same way?" Menendez replies: "Joe, the people of New Jersey elected me to the United States Senate in 2006 by a very ... by a healthy margin. And I have worked very hard to keep their faith and confidence. How? By voting for middle-class tax cuts. Middle-class tax cuts that actually help, including the payroll tax cut. The average New Jersey family get[s] about $3,500 dollars in tax relief. "By helping those same families with the educational opportunity tax credit get about $2,200 dollars to help their kids go to college. By making sure that two million New Jerseyans were not bit by the alternative minimum tax that needed a patch to ensure that now it wouldn't creep up into all those New Jerseyans. I led that effort in the Senate Finance Committee with Orrin Hatch of Utah. So the reality is, would I do all those things all over again? Absolutely." In an ad released Tuesday on YouTube, the Kyrillos campaign again edits out the remarks that precede Menendez’s "absolutely" answer. 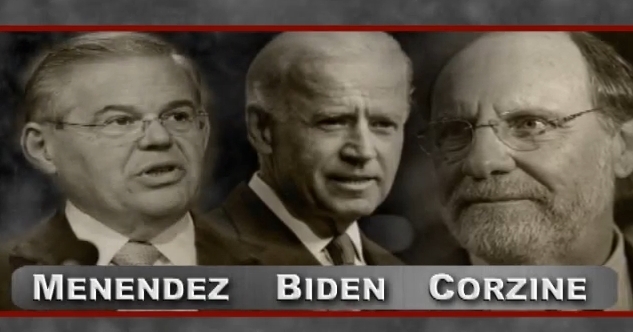 The ad links Menendez to Corzine, as well as Vice President Joe Biden. A narrator begins the ad by saying: "Joe Biden is campaigning in New Jersey with Bob Menendez. But should we listen to what Biden or Menendez say? After all they get their financial advice from Jon Corzine." The ad then shows video clips of Biden and Menendez praising the financial prowess of Corzine, before cutting to clips from the Oct. 10 debate. "Bob is pursuing a Jon Corzine economic strategy ... and the results are 23 million Americans out of work ... if he had to do it over again, would he do it the same way?" Kyrillos says. Then the ad show Menendez answering: "So the reality is, would I do all those things all over again? Absolutely." The narrator comes back in to say: "It's shocking. Biden and Menendez get their economic advice from Jon Corzine. The man who nearly bankrupted New Jersey and is under investigation for bankrupting MF Global. No wonder our country's debt has skyrocketed."